Apple Now Selling Unlocked iPhone 5 Units, Starting At $649. Apple has finally made the unlocked iPhone 5 available from its online store as of yesterday evening. The unlocked devices will fall in line with our anticipated price models beginning at $649, $749, and $849 for 16GB, 32GB and 64GB of storage, respectively. All three models are listed as shipping in one week. There’s no word from Apple as to when their retail stores will begin carrying unlocked models for sale, though early reports indicate we could see inventory arrive as early as today. The unlocked models are GSM only, which is great for AT&T and T-Mobile customers in the US, but not so much for those of you on the Sprint and Verizon networks. Unlocked iPhone 5 devices are excellent pickups for international travelers who will use the device on GSM-based networks worldwide needing only to SIM swap to get up and running. While most countries get unlocked units right from the start, the US waits until sometime after the initial launch dies down. We can all thank the carriers for that. You can grab your unlocked order in at the Apple link below right now! Apple introduces variable iTunes Gift Cards. for holidays. In the spirit of the holiday season, Apple has released variable iTunes gift cards to third party retailers. The cards can be bought at any value between $15 and $500. They work in exactly the same manner as the previous iTunes cards, the only difference now is that you can choose just how much money you’d like to spend on buying it, making it an ideal gift. This really steps up the variety of the card, considering that before it was only possible to purchase 15, 25, 50 or 100 dollar cards in retail stores. The cards aren’t available online, so if you’d like one, you’d best check your local store. According to 9to5 Mac, there is one supermarket and one retail chain that has these on the shelves already, expect more stores to follow suit very soon. Hands on with iTunes 11. After a month delay, iTunes 11 was finally released yesterday. As we previously reported, the updated version was postponed due to an engineering problem that forced Apple developers to take some time to rebuild the program.The company had announced the new update and many of the expected features back in September at its iPhone 5 event, but it wasn’t until we actually got some hands-on time with the new iTunes that we were really able to grasp what a major change this is for the music app. An app used by both Mac and PC users alike; iTunes gets a lot of use, so let’s see what an extra month allowed Apple to do. Here are some of iTunes 11’s new features. The MiniPlayer could be one of the biggest changes or one of the most minuscule – depending on how many people realize it has actually been updated. MiniPlayer is one iTunes feature that often went unused simply because it didn’t have much functionality before. In previous versions of iTunes, the MiniPlayer simply allowed users to minimize their iTunes screen and turn it into a small widget. The MiniPlayer showed the song name and allowed users to pause, play, and flip forward or backward between songs – and that’s about it. With iTunes 11, MiniPlayer has not only increased its functionality but it also updated its look. Apple has hidden the forward and backward buttons, the play/pause button, and the volume buttons so that they only appear when you hover over the MiniPlayer. Other new additions include a search bar, which searches your entire library; an audio menu, which allows you to select your speakers via AirPlay; and a list of songs you’ve added to your Up Next menu (more on Up Next below). The updated MiniPlayer might be one of the most underrated features on iTunes 11. The way you navigate through the library is probably the biggest change to iTunes. The sidebar, which has been a staple in the application’s history, is gone, leaving a huge mass of space for your album art to take over. If you want to switch between music, movies, TV shows, home sharing, or network libraries, there’s a thin drop-down menu in the upper-left corner of the app. The only problem is, it makes it more difficult to navigate through videos, music, TV shows, apps, and the iTunes store. It’s a small sacrifice for the added screen space and, after you see how much better the app is, aesthetically, you’ll be wishing Apple implemented this feature years ago. Since the sidebar is gone, the playlists feature has changed. On the top of the library, there are tabs that allow you to navigate between artists, genres, songs, albums, and playlists. The artists and playlist menu bring up a smaller sidebar, which provides a list of whatever playlist or artist you’re looking for. We use playlists a lot and found this change to be just as efficient as the old sidebar. Both the iTunes Store and iTunes Match are also accessible from the top of the library. iTunes Match costs $25 a year and stores your entire library in iCloud, which lets you play your music and videos on any iOS device and your Apple TV. Speaking of the iTunes Store, for some reason, the OS X version was different from the iOS version in previous iterations of Tunes. Not a big deal for some, but kind of a pet peeve for others. Now, Apple’s synced up the iTunes design so that it looks the same on all devices, no matter if they’re running iOS or OS X. Expanded view changes the way you sift through music. It works a lot like the iOS folder mechanism: click on the album cover, and a list of songs open below the album. Also, the columns that have been a staple of iTunes, which allowed users to sort their data through various categories, like last played, date added, year, rating, and more, are completely gone. However, you can get them back using the View menu while you’re in the Songs section. Just like with iOS 6, Apple has added preview history, allowing users to view the songs they’ve previewed on one device on another device. So, if you’re browsing through songs on your iPhone while on the go, you can actually download the song on your computer once you get home and save yourself the hassle of trying to remember what it was. Thanks to iCloud, the song will be saved in your preview history. iTunes 11 lets you access your iTunes content on all of your iOS devices. Users can now download songs from their library for offline use, which can be useful when traveling. iCloud also remembers where you left off, so if you’re watching a movie on your MacBook but have to run out the door, you can continue watching on your iPhone and start from the exact spot you left off. Apple’s iBooks and Safari – and even popular third-party services like Netflix – have had this feature for years, and while it’s taken some time for iTunes to jump on board, it’s certainly a welcome addition. iTunes 11 is probably the fastest version of the program we’ve seen yet. From loading up and selecting music, to downloading and playing videos, iTunes 11 is much faster than its predecessors. However, Apple did slightly increase the amount of CPU it uses in order to make the app faster. According to our tests, when playing music on iTunes 10, the program took around 5 percent of our CPU. In iTunes 11, iTunes takes up to 7.5 percent. We did a similar test for videos by playing the pilot episode of “Revolution.” The copy we used was downloaded from the iTunes Store and is high-def quality. The program took up about 20 percent of our CPU with iTunes 10, and 21 percent with iTunes 11. Clearly, this isn’t a big change, but it’s important for users with slower, older, computers. With the sidebar gone, your devices are now accessible in their own little tab in the upper right-hand corner of the screen. If you have more than one device, you’ll be able to manage them by clicking on the devices tab, which brings up a drop-down menu of all of your connected devices. A very familiar screen comes up that resembles the device page from older versions of iTunes. There is one addition: a tab that says “On This Device,” which gives you a rundown of exactly what’s on each device. It’s a welcome addition that puts everything on your iPad, iPod, or iPhone into a simple list that’s easy to navigate. Gift card scanner to come? According to CNET, there’s one more feature coming out in the next incremental update: a gift card scanner. Reportedly, the feature will let you use your iSight camera to add gift cards to your account. Though it’s not currently available, iTunes will pull the alphanumeric code on the gift card so that you don’t have to type it in. In order for it to work, the code must be printed within a rectangular box for the camera to recognize it. Users can still type in the code in case the iSight camera doesn’t pick it up. Should you get iTunes 11? In a word, yes. iTunes 11 is a fantastic update. Apple has made it a lot faster, sleeker, and added many new features. The removal of data-filled columns and the sidebar leave the screen uncluttered and much easier to navigate. iTunes 11 looks like something modeled after Apple’s iOS design, which is just a continuation of Apple’s quest to create a unified operating system between its mobile devices and computers. It worked with Mountain Lion, which added key iOS features like Notification Center and iMessages, and it certainly works with the new iTunes update. Clearly, CEO Tim Cook, and Apple executives Jony Ive and Eddy Cue are working diligently to push Apple into the future. And, if the future of Apple looks as great as iTunes 11, we can’t help but be excited. 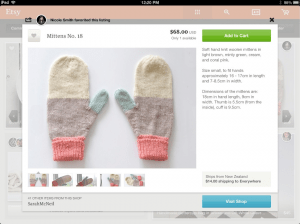 Official Etsy App Debuts On iPad. 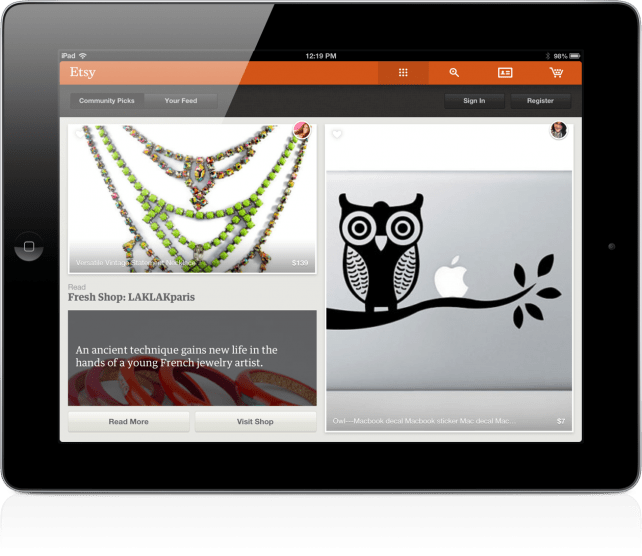 Etsy, the official iOS client of the popular e-commerce site of the same name, is now available for iPad. Prior to this point, the only way to get Etsy on the tablet was through third-party apps such as I Heart Etsy. The Etsy 2.2 version also includes a number of new tools for iPhone users. Launched on the Web in 2005, Etsy focuses on handmade or vintage items, as well as arts and craft supplies. To date, the service has over 800,000 active shops and 20 million customers. You can download Etsy in the App Store. 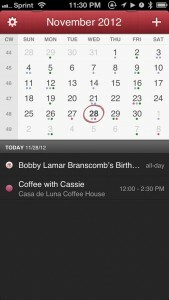 Fantastical For iPhone Is The Beautiful Calendar You’ve Been Looking For. Fantastical ($1.99) by Flexibits Inc. is simply the calendar for your iPhone. I’ve gone through my fair share ofcalendar apps before on the iPhone, but I have to say: Fantastical blows them out of the water, especially Apple’s own Calendar.app. Fantastical is quite literally, fantastic.If you have ever used the Mac version of Fantastical, then you will know that this app is one of the best calendars for the platform. And of course, it’s no different with the iPhone. Even though I had chosen Agenda as the winner in my Showdown back in July, it looks like I’ve finally found a change in my home screen after weeks of keeping it the same. Fantastical is just that good. Like other calendar apps, Fantastical will fetch data from whatever you have set up for your Calendar.app through Settings.app. There are no additional steps to set anything up, unless you haven’t been using your Calendar already. Once the app is launched, you are presented with a gorgeous interface that is reminiscent of what is found in the Mac app. You have the textured red header bar at the top, which displays the month and year, because we always need to be reminded of the time (it is wibbly wobbly, timey wimey stuff, after all).Underneath the header bar, Fantastical will display five days at a time, and you’re able to see the day of the week as well as the date. Any events on particular days will be indicated with a color-coded event bar. The day in the center will be under a virtual “magnifier,” as it will be bolded to stand out from the other four days. A list of previous and upcoming events will be available to view underneath the days of the week, and both will scroll simultaneously to coordinate with the other, which is a great touch. If you need to take a look at your entire month, just give the week ribbon a pull down. 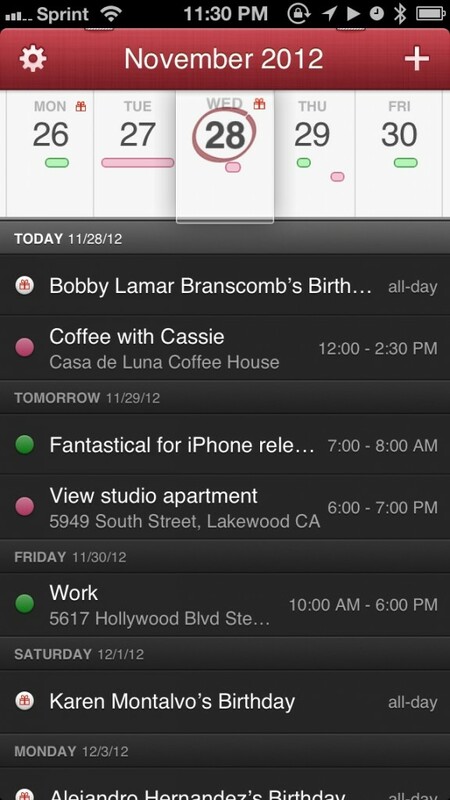 Small color-coordinated dots will show up days with events. To switch back, repeat the gesture. For your convenience, in both views, today is circled in red, and a search field is available between views. No matter what you’re looking for, Fantastical will search in real-time and you can filter results between Title, Location, Invitees, and All. While the design of viewing your calendar is beautifully executed and superb, the real magic of Fantastical lies within adding events. Why is that? Because Fantastical uses natural language input for your events, and magically sorts out details based on what you write. For those who are unfamiliar with natural language input, you basically write out your events in this fashion: “Have lunch with Bob on Thursday at 12 pm,” or “Grab coffee with Jamie tomorrow at 9 in the morning.” Fantastical will analyze your sentence and display a live preview of your event as it would show up in the calendar. Of course, sometimes it may not be 100 percent perfect, so you can also tap on “Show details” to reveal an iOS-style event editor. For the most part, though, you probably won’t need to edit any details from this screen, except maybe changing the calendar you want to add the event to (if you use multiple calendars). I wish that the natural language detection would be able to determine which calendar to add it to, but from multiple attempts, it seems that it’s not possible. Fantastical has a settings panel as well, which you can access at any time from within the app. In this screen, you can switch to month view, though it’s much easier to just perform the pull-down, personally. You can also choose which of your calendars to display, what day of the week to start on, show event end times, and toggle calendar weeks on month view. I’ve been using Fantastical for the past couple of days, and it’s becoming one of my most-used apps on my home screen. I had bought the Mac app when it first came out, and fell in love with the simplicity and ravishing design, and am incredibly pleased to see it brought over to the iPhone. It’s incredibly fast to see the upcoming events I have laid out, and getting new events on my calendar has never been easier. Even though Agenda had some pretty fast event creation, I don’t think anything can beat natural language input. And that icon — seriously, how can you not fall in love with it? Fantastical really does live up to the name, and you should definitely go download it in the App Store right now for $1.99 (50 percent off for a limited time). This is the calendar app you don’t want to miss. Indianapolis Colts replaced its 800-page playbooks with 120 iPads. Apple’s iTunes 11 could debut tomorrow. After a month-long delay, the next generation of Apple’s popular iTunes music software could launch as early as tomorrow. iTunes 11 could make its long-awaited debut Thursday, The Wall Street Journal reported this evening in a profile of Apple Senior Vice President Eddy Cue. While not exactly offered as the definitive release date, Thursday is the second to last day before Apple’s self-imposed deadline for releasing the new software. “We look forward to releasing this new version of iTunes with its dramatically simpler and cleaner interface, and seamless integration with iCloud before the end of November,” Apple spokesman Tom Neumayr told CNET at the end of October. Apple’s last major iteration of iTunes, version 10, was released in September 2010. Since then Apple has added additional features like iTunes Match, iTunes in the cloud, and 1080p videos from the iTunes Store. The new iTunes is expected to come with an entirely revamped user interface, Facebook and Twitter integration, and deeper iCloud support. It will also remove the failed music-focused social network Ping.